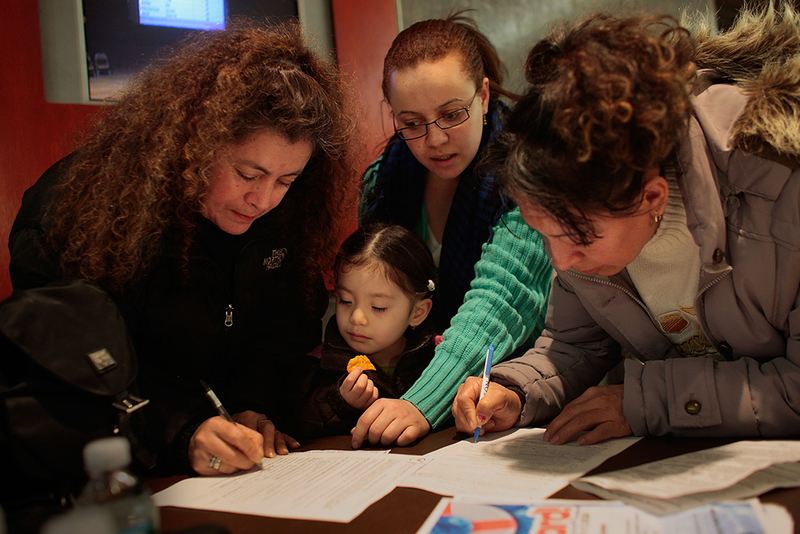 A school administrator helps translate school admissions lottery forms for Spanish-speaking parents in the Brooklyn borough of New York City, April 2009. A centralized enrollment system with a fair, transparent algorithm helps families navigate public school choice options and is more efficient for schools and districts. While the expansion of school choice has allowed parents or guardians to select schools that best meet their children’s needs, some application and enrollment processes can present barriers to families with less time or familiarity with the system. In decentralized systems, for example, students must apply separately to each school. Some students may get multiple offers and hold onto seats they do not intend to accept, while others may not receive any offers at all. Families without the information or time to strategize are often left with the least in-demand schools, which often have worse academic outcomes. Meanwhile, schools and districts find it difficult to forecast enrollment as students constantly shift across their rosters and waitlists. A centralized system can simplify enrollment for both families and schools. Students apply through a single application, ranking a list of schools that they would like to attend and receiving a single offer to one of their preferred schools. However, system design matters when it comes to centralized enrollment. Depending on how a district assigns an offer for each student, some families can unfairly manipulate the system to make it more likely that their child secures a seat at a more in-demand, usually better-performing school. Notably, there are many contentious policy issues related to public school choice that are beyond the scope of these algorithms. For instance, communities debate which types of schools should exist and how the city and state should allocate public dollars to those schools. Families also tend to demand more seats in the most desirable schools. There should be no debate, however, that all families should have fair and equal access to the public schooling options that do exist. Carefully designed assignment systems, based on the most efficient and effective algorithms, help ensure that all families have such access. When districts allow students to attend schools outside their neighborhoods, disconnected application and enrollment processes can be difficult for families to navigate. Decentralized systems benefit families who have more time or knowledge to game the system. While a centralized enrollment system may help reduce these inequities to some extent, it must also use fair and efficient matching algorithms to further level the playing field. The authors partnered with Parag Pathak, professor of microeconomics at the Massachusetts Institute of Technology (MIT); Eryn Heying, assistant director at MIT’s School Effectiveness and Inequity Initiative (SEII); and Maggie Ji, policy and research manager at the SEII, to describe the fairer, more equitable, and more efficient school matching algorithms. Pathak, Heying, and Ji helped identify the central components of these algorithms and connected the authors to districts that have successfully implemented them. Some cities require families and students to apply to each school separately, because there is no centralized system to coordinate application and enrollment across schools. Decentralized systems require families to devote time and resources to the selection process: They have to learn about and perhaps visit each school, keep track of various application timelines, and submit applications to each school. This can be particularly difficult for economically disadvantaged families, families who do not speak English at home, and single-parent families. Centralized enrollment creates a single application and assignment process for participating schools. Students submit one application ranking their desired schools. A coordinating organization—usually either a school district or an independent nonprofit—manages the application process and uses a computerized set-of-rules program, or algorithm, that aims to match students to a school on their list. Each matched student receives a single school offer. Unified enrollment is a centralized enrollment system in which all or most schools in the city, including traditional public and charter schools, participate. Unified enrollment simplifies the application experience for families and is more efficient for school districts, because it coordinates enrollment across sectors. First, the entity that manages the enrollment process places students in priority groups. Districts may choose to determine priorities such as increased school diversity, neighborhood cohesion, lower transportation costs, or expanded access to high-quality schools for economically disadvantaged students. If a district priority is to minimize transportation costs, students who live near a school might receive priority over students who live in other parts of the city. Depending on the enrollment entity’s priorities, students may also receive higher priority at a particular school if they have siblings attending that school; if they are applying to continue at a combined middle and high school; or if they are eligible for free or reduced price lunch. While centralized enrollment simplifies the application process by creating a single access point for families, not all centralized enrollment systems are created equal. Though it may seem like a technical detail, the design of the algorithm that matches students to schools significantly affects students’ chances of being placed at their preferred school. Traditionally, some districts with centralized enrollment have used simple algorithms that try to assign as many students as possible to the school they rank as their top choice. These algorithms have a so-called first preference first mechanism, wherein students are given priority at each school according to how high they ranked that school among their choices. Under these systems, informed applicants may know that many other students are likely to rank the desirable School A at the top of their list. They may then choose to rank the slightly less desirable, but nonetheless preferred, School B as their own top choice, avoiding the risk of being denied admission to School A and maximizing their chances at School B. Applicants without information about schools’ relative popularity or with less understanding of various trade-offs would likely rank School A as their top choice, thereby increasing their likelihood of losing out on a seat not only in School A, but also in their second choice, School B. Systems driven by a first preference first mechanism incentivize applicants with more information to manipulate the system. As a result, applicants with more information are more likely to get a seat in one of their desired schools. Applicants without this knowledge may rank long-shot, in-demand schools first, causing them to get locked out of placement in not only their first-choice school, but also in other schools that they ranked second or lower. It is challenging for applicants to accurately assess the odds of being accepted to a certain school and strategize their school rankings accordingly. However, it can be especially difficult for economically disadvantaged or disconnected families who may lack the time and information to play the game. Furthermore, experience and social networks increase understanding of the application process, putting newcomers at a disadvantage. Atila Abdulkadiroglu, Parag Pathak, Alvin Roth, and Tayfun Sönmez, economists specializing in game theory and market design, crafted school choice matching algorithms that are resilient to gaming and produce better matches for all students. Two algorithms—DA and TTC—do not penalize students for ranking high-demand schools at the top of their lists, and districts can customize the DA or TTC algorithms to reflect their policy goals. Policymakers should consider the trade-offs of each to determine which algorithm best suits their context. DA and TTC are strategy-proof algorithms that consider student preferences alongside district and school priorities to create a single best offer for each participating student. As previously noted, districts can customize both DA and TTC. Overall, the two algorithms are more similar than different. However, districts and policymakers should consider the trade-offs of each to determine which is best for them. DA is unique in the way it matches students to schools. It loops through a series of tentative matches between schools and students; no decision is final, and each acceptance is deferred until the entire process ends. Each student applies to his or her first-choice school, which either tentatively accepts or rejects the student based on its priorities. Each student who is not yet matched to a school applies to their next choice. Each school tentatively accepts or declines the student and can release a student who was tentatively accepted in a previous round if a new applicant with higher priority emerges in a later round. The process continues until all students are matched or until students exhaust all their preferences. If students do not receive any of their preferences, the entity that is managing the enrollment process will assign them to a school. One way to think about the DA algorithm is in terms of a card game in which schools are players and applicants are cards. Players have in mind the suits they prefer and try to build their preferred hands as cards are distributed to them—that is, each school uses its enrollment priorities to determine which students it will tentatively accept. Meanwhile, written on each card is an ordered list of players that dictates the order in which cards are distributed to the players—that is, each student submits a ranked list of schools. At the start of the game, each card is dealt to the first player written on it. The players keep all the cards they are dealt, unless they end up with more cards than they can hold. In this case, players would only keep the cards with their preferred suit and give back the extra cards to the dealer. In the event that a player has to decide between multiple cards of the same suit, she or he makes the decision based on a dice toss—the equivalent of lottery numbers in a DA system. The dealer then distributes each of the remaining cards to the second player written on them. Again, the players either: keep the cards if their hand is not yet full; keep the cards and trade back less preferred cards if their hand is full; or decline the card because their hand is already full with cards that they prefer. The process repeats until the dealer either has no cards left or until each card has already been sent to all the players written on it. In the school enrollment context, the entity that is managing the enrollment process will assign a student to a school if the student does not receive any of his or her preferences. Because assignments are not finalized until the end of the DA process, each applicant has a fair chance of being considered by a school on her or his list, regardless of how high she or he ranked the school compared with other applicants. Applicants gain nothing from misrepresenting their true preferences or ranking fewer schools. Because DA cannot be gamed, it levels the playing field for families regardless of the time and resources they possess. In contrast to conventional algorithms, DA ensures that matches strictly adhere to enrollment priorities and student preferences. A student will never lose his or her spot at a preferred program to a student with a lower priority. Therefore, no student and school pair should prefer each other over their assigned matches. However, after DA has finished running, there may be pairs of students who would rather have the other’s assigned school—but these instances are exceedingly rare. It is not possible to have a system that strictly adheres to enrollment priorities and student preferences and also never results in an instance where a pair of students may want to trade their assignments, in violation of a school’s priority. Like DA, TTC cannot be manipulated by applicants who strategically rank schools. However, unlike DA, TTC seeks to swap assignments between students to ensure that they receive their more preferred choice, even if their preference does not match the enrollment priorities of each school. In other words, TTC does not strictly adhere to enrollment priorities but rather favors the goal of trying to maximize student choices. As with DA, TTC gives no advantage to students who misrepresent their true preferences or rank fewer schools than they would attend in order to get into one of their top choices. Because the algorithm only swaps to move students to a more-preferred school, students benefit from the algorithm only if their application states the true order of their preferences. In contrast to DA, TTC provides the best possible matches across all students. After the TTC algorithm finishes running, no two students should want to switch their assignments with each other. Because swaps involve trading priorities between students, TTC may not be suitable if districts want to strictly adhere to their own enrollment priorities. However, the progression of trading cycles does take into account enrollment priorities to the maximum extent possible, while also ensuring the best possible matches for students. Currently, no public K-12 districts use TTC. New Orleans’ Recovery School District used TTC to match students in 2011 but switched to a DA system soon after to incorporate public and private schools that wanted to preserve their enrollment priorities.14 Policymakers in some cities also report that TTC is more difficult to explain to parents and students than DA, but it may be appropriate if a city or district wants to prioritize the best possible matches for students. This may be particularly relevant when schools’ priorities are geographic considerations and not based on criteria such as entrance examinations or interviews. Both DA and TTC require schools to participate in centralized assignment, where all students apply using one application and are assigned to one school. Implementing centralized assignment requires a standardized, transparent set of assignment rules across participating schools. Unified enrollment requires an additional step: All public schools in a city or region, including traditional public schools, magnet schools, and public charter schools, must participate and buy into the centralized enrollment system. What are the enrollment priorities? Districts must decide on the policy objectives governing enrollment priorities in the matching process. These objectives often require community buy-in. Many centralized enrollment systems include enrollment priorities for siblings, students who live near a school, or students who previously attended a feeder school—schools that send the majority of their graduates to a particular school that may have a similar theme or instructional program. Systems may also give priority to students who qualify for free or reduced price lunch. How will policies be communicated to students and families? The managing entity should provide informational tools for families to understand the goals and operation of the enrollment system and its benefits; learn about the available school options; and receive instructions for applying to schools and checking results. Most entities that manage the enrollment process offer these resources online. Some hire community liaisons to partner with community-based organizations to share the information in community centers or even from door to door. What technology systems need to be put in place? Computerized systems can help ease the burden of collecting application forms, linking applications to existing registration data, and running the assignment algorithm. The considerations listed above are critical to any centralized matching process, and the associated costs are not specific to only DA or TTC. This section describes three districts that are currently using DA within a unified enrollment system: New Orleans, one of the oldest adopters of the algorithm; Indianapolis, which launched its OneMatch system in 2017; and Denver, which adopted unified enrollment using DA in 2012. Each matching process looks different to reflect the districts’ unique political and education contexts, but the use of the algorithm ensures fair access to public schools of choice and efficient matching. To collect information for these case studies, the authors interviewed individuals who developed or managed enrollment systems in New Orleans, Indianapolis, and Denver. New Orleans is unique in that the vast majority of its public schools—all but two—are charter schools. Following Hurricane Katrina in 2005, the Recovery School District (RSD)—a statewide school district that assumes oversight of underperforming schools across the state—took control of most public schools in New Orleans and converted them to charter schools.22 Citywide enrollment was decentralized for most public schools, which required families to travel around the city and individually apply to each school they considered. Ray Cwiertniewicz, the former executive director of student enrollment at OPSB who was responsible for supervising OneApp, notes that one of EnrollNOLA’s biggest ongoing challenges is helping families understand how the enrollment process works—specifically, what OneApp can and cannot do. Parent and guardian engagement is vital to running an effective unified enrollment system. As the entity that runs the matching process, EnrollNOLA is a necessary touch point for all families, and many families come to the organization with concerns beyond enrollment. Cwiertniewicz said, “It is hard for some families to separate enrollment processes with the fact that there are not enough seats to meet demand for many schools.”26 When concerns go beyond enrollment, the organization connects concerned families to other agencies. EnrollNOLA works closely with the other departments at the RSD and OPSB to connect families to the right individual with whom they can share their concerns. EnrollNOLA also uses the information it collects from enrollment management when determining charter renewals or growth within a charter network. These data are also shared with outside researchers who use the data to shed light on school performance. The OneApp system has also dramatically increased the data available to the RSD and OPSB. Students cannot receive multiple offers, enabling policymakers to make more accurate enrollment projections. In addition, OneApp collects a wealth of data, including on school demand and school transfers, that helps the RSD and OPSB support schools and plan for school expansion, closure, or development. Keep family experience at the top of your mind. Try applying for seats in an area with centralized systems and in areas without to understand how difficult it is to access decentralized choice systems. Implementing this system gets easier with time. The hardest part of creating the system is disrupting the status quo with a unified enrollment system. Within a few years, schools realize that they can be successful with a centralized system and it greatly increases efficiency. During the 2017-18 school year, the city of Indianapolis launched a landmark unified enrollment system. The nonprofit organization Enroll Indy created a single application point, OneMatch, for all public schools in the Indianapolis Public Schools district and more than 90 percent of the charter schools authorized by the city of Indianapolis and the Indiana Charter School Board (ICSB). Indianapolis has various types of public schools, including magnet, choice, innovation, and neighborhood schools. For the past several years, IPS had a common application system for its magnet and choice schools, but the system lacked transparency. Families did not understand the process the district used to assign students. Some students received multiple offers to different schools, while other students received none. Districts finalized placements behind closed doors, making it difficult for families to assess if assignments were fair. Until 2017, each Indianapolis charter school ran independent applications and lottery processes on different deadlines. In 2015, Hannon received a seed grant from the Michael and Susan Dell Foundation and the Walton Family Foundation through The Mind Trust and developed a steering committee with stakeholders from IPS and charter schools in Indianapolis. The group met every two weeks for six months to discuss how Indianapolis could adopt changes to the enrollment system to make it fairer, more efficient, and more transparent. The working group was a key mechanism in giving key players a say in the development of the new system. They discussed questions both big and small: Who would run the process? How many schools could families rank on the application? Hannon also convened parents to provide input on questions related to their experience. Recommendations from the steering committee and parent group were taken to an executive committee that included the superintendent of IPS, the head of charter schools for the city of Indianapolis, and the chair of the ICSB. Given the political dynamics within the city, the group decided to create an independent organization, Enroll Indy, to operate the unified enrollment system. Enroll Indy has been philanthropically funded since its inception in 2015. During fiscal year 2019, the three public entities that oversee Enroll Indy—the city of Indianapolis, IPS, and the ICSB—will contribute public dollars to the organization. Unified enrollment simplified and streamlined the application process for families in Indianapolis, and participation in the unified enrollment process increased the number of applications to IPS choice schools. Applications increased from 2,800 students for the 2017-18 school year to 3,800 students for the 2018-19 school year. Enroll Indy is unable to report the change in participation rates for charter schools, because charter schools did not use a common enrollment system until this year. Furthermore, Enroll Indy saw more applications in the areas in which it canvassed to increase awareness of OneMatch to community members. Based on census tract data, Enroll Indy increased participation among low-income families and narrowed the income gap among families who applied before the first and final deadlines. As of July 2018, Enroll Indy had received 9,668 applications for the 2018-19 school year, and 84.5 percent of those applicants were matched with one of their ranked schools. Don’t let the perfect be the enemy of the good. Every district or related entity will start this process from a different place. You can refine the algorithm and process as you go, and it is most important to get something off the ground. Develop a clear problem statement to build political support for a change. Many of the priorities in Denver’s system are similar to those of other districts. For instance, students have a better chance of getting into a school if they have a sibling attending, making it easier for parents to drop off and pick up their children. Students are also more likely to get into a school within walking distance, a priority meant to foster community cohesion. DPS used application and enrollment data from previous years and ran different models to determine how to assign priority to students to ensure that schools were more reflective of the city’s population. Schools were given the option to opt into the pilot, which helped ensure that the shift in enrollment was gradual and that participating schools would be able to prepare and ensure a better experience for all students. The ultimate goal of school systems is to improve the quality of all public school options and advance student outcomes. A rise in public schools of choice, including charter, innovation, and magnet schools, has allowed parents and guardians to select among more public options to find a school that is likely to best meet their children’s needs. Unfortunately, most existing public school choice enrollment systems are unfair and difficult for families to navigate. Families with more time and knowledge of these processes have an advantage and can manipulate the system. Parag Pathak and his colleagues developed algorithms to ensure that any district can efficiently and fairly administer a common enrollment system. Deferred acceptance and top trading cycles are strategy-proof and encourage students and their families to accurately report their school preferences. Various districts across the country have implemented these algorithms with positive results. These districts match more students with one of the schools they rank than districts with conventional enrollment algorithms. As school systems with multiple public school options for students continue to work to improve the quality of all schools, they should also make sure that every student has a fair shot at the school he or she wants to attend. To that end, implementing unified enrollment systems using DA or TTC is an important step that every public school system should take. Ulrich Boser is a senior fellow at the Center. The authors would like to thank the William T. Grant Foundation for their generous support of this project. The authors would also like to thank Parag Pathak, the Jane Berkowitz Carlton and Dennis William Carlton professor of microeconomics at MIT; Eryn Heying, assistant director of the SEII; and Maggie Ji, policy and research manager at the SEII, for their expertise and invaluable feedback. The authors would also like to acknowledge Caitlin Hannon, executive director of Enroll Indy; Ray Cwiertniezicz, former executive director of student enrollment at the Orleans Parish School Board; Gaby Fighetti, chief of student access at Orleans Parish School; Brian Eschbacher, former executive director of planning and enrollment for Denver Public Schools and founder of Eschbacher Consulting; and Jim Carpenter, executive director of planning and choice at Denver Public Schools, for sharing the stories and impact of these systems in Indianapolis, New Orleans, and Denver, respectively. This appendix includes additional research and technical resources on centralized enrollment systems, including deferred acceptance and top trading cycles algorithms. Atila Abdulkadiroglu, Parag A. Pathak, and Alvin Roth, “Strategy-proofness versus Efficiency in Matching with Indifferences: Redesigning the NYC High School Match,” American Economic Review 99 (5) (2009): 1954–1978, available at https://economics.mit.edu/files/3962. Description: The authors evaluate different ways to assign tiebreakers to students who share the same level of priority at a given school in a two-sided market, such as New York City, where both students and schools carry distinct preferences. They highlight the trade-off between a system that is strategy-proof and one that yields the most efficient matches. Parag A. Pathak, “What Really Matters in Designing School Choice Mechanisms.” In Bo Honoré and others, eds., Advances in Economics and Econometrics: Eleventh World Congress, Volume 1 (Cambridge, United Kingdom: Cambridge University Press, 2017). Description: This paper highlights the most important and common issues involved in the practical design of school choice systems: vulnerability to manipulation; transparency of the assignment process; coordination of offers across multiple schools; aftermarkets for unmatched or unsatisfied students; and influences on student preferences, such as household decision-making and school quality. Description: Common enrollment systems are necessary to implement a DA or TTC model. This white paper offers guidance to policymakers as they engage with stakeholders to shift toward common enrollment. Atila Abdukladiroglu and Tayfun Sönmez, “School Choice: A Mechanism Design Approach,” American Economic Review 93 (3) (2003): 729–747, available at https://www.aeaweb.org/articles?id=10.1257/000282803322157061. Description: This paper launched the agenda of using ideas from matching theory for school assignment. It first proposed that Gale-Shapley and TTC can be used for school choice and provides a concise description of both of these mechanisms and their properties. Atila Abdulkadiroglu and others, “The Boston Public School Match,” American Economic Review 95 (2) (2005): 368–371, available at https://economics.mit.edu/files/3021. Description: Drawing on prior work by Abdulkadiroglu and Sönmez, the authors detail how Boston’s previous assignment system, which relied on sibling and walk zone priorities, disincentivized students from ranking their true preferences. They propose the DA and TTC mechanisms as alternative system designs to remove this disincentive. The former would guarantee that no student would lose a seat to a student with lower priority and be assigned to a less preferred school, while the latter would guarantee final assignments in which no two students would both be better off by switching their seats. Atila Abdulkadiroglu, Parag A. Pathak, and Alvin E. Roth, “The New York City High School Match,” American Economic Review 95 (2) (2005): 364­–367, available at https://seii.mit.edu/wp-content/uploads/2011/12/Paper-New-York-City-High-School-Math.pdf. Description: The authors describe their work to help New York City redesign its public high school matching procedure. The previous decentralized system, which allowed five choices and multiple offers per student, suffered from congestion that resulted in 30,000 students being administratively placed in programs that they had not chosen. It was also prone to manipulation, as students were encouraged to consider their competition before revealing their true preferences. Some schools also concealed capacity to reserve seats for more preferred students.In 2004, the New York City Department of Education implemented a student-proposing DA algorithm, which allowed 12 choices per student and minimized incentives for students to game the system. This algorithm was appropriate for a two-sided market such as New York City, where students have distinct preferences for different schools and schools have distinct preferences for different students. As a result of the implementation, the number of students left unassigned dropped from 30,000 in the 2002-03 academic year to 3,000 in the 2003-04 academic year. Parag A. Pathak and Tayfun Sönmez, “Leveling the Playing Field: Sincere and Sophisticated Players in the Boston Mechanism,” American Economic Review 98 (4) (2008): 1636–1652, available at https://economics.mit.edu/files/3025. Description: The authors document different types of student applicants in the Boston allocation mechanism. Some applicants are “sincere,” meaning they report their true preferences. Others are “sophisticated,” meaning they report preferences to achieve the best possible placement given other applicants’ preferences. The authors demonstrate that sincere students tend to lose their priorities to sophisticated students. Sophisticated students may receive a better placement under the Boston system than they would under DA, which does not incentivize gaming the system. In light of these findings, the authors argue that strategy-proof mechanisms such as DA would help ensure fairness across applicants with differing levels of sophistication. Parag A. Pathak and Jay Sethuraman, “Lotteries in Student Assignment: An Equivalence Result,” Theoretical Economics 6 (1) (2011): 1–17, available at https://econtheory.org/ojs/index.php/te/article/viewFile/20110001/4777/165. Parag A. Pathak and Tayfun Sönmez, “School Admissions Reform in Chicago and England: Comparing Mechanism by Their Vulnerability to Manipulation,” American Economic Review 103 (1) (2013): 80–106. Description: The authors argue that invulnerability to manipulation is an increasingly important objective for policymakers in school assignment systems, illustrated by policy changes in Chicago and England. However, some newly adopted assignment systems do not completely eliminate vulnerability. The authors propose a formal approach to compare vulnerability to manipulation across different systems. They find that the so-called first preference first mechanism, wherein students are given priority at each school according to how high they ranked that school among their choices, is most prone to manipulation. Christopher Avery and Parag A. Pathak, “The Distributional Consequences of Public School Choice.” Working Paper 21525 (National Bureau of Economic Research, 2015), available at https://www.nber.org/papers/w21525.pdf. Description: The authors develop a model for simulating the potential of school choice programs to improve access to high-quality schools relative to residential programs. Results suggest that school choice programs are more effective at narrowing the range of differences in quality across schools in a city. However, the lowest-income families may not necessarily have greater access to school quality. The narrowed range in school quality is reflected in housing prices, thus families at the extreme ends of the income spectrum seek more suitable options in another city. Umut Dur and others, “Reserve Design: Unintended Consequences and the Demise of Boston’s Walk Zone,” Journal of Political Economy (forthcoming). Description: The authors show that, in a DA mechanism, reserved seats can be ineffective in boosting the priority of certain students if the order of precedence is incorrectly specified.47 Both increasing the number of reserved seats relative to open seats and raising the precedence of open seats relative to reserved seats leads to increased likelihood of admission among applicants eligible for the reserved seats. Atila Abdulkadiroglu and others, “Minimizing Justified Envy in School Choice: The Design of New Orleans’ OneApp.” Working Paper 23265, (National Bureau of Economic Research, March 2017), available at https://www.nber.org/papers/w23265. Description: The authors demonstrate that TTC mechanisms are suitable for assignment systems that seek efficiency as a primary goal; in other words, the final assignments are such that there is no way for two students to both benefit from swapping their assignments. Compared with all other similarly efficient mechanisms, TTC results in the fewest number of students who lose a seat at a school they prefer to another student with lower priority—so-called justified envy. In comparison, the more common DA algorithm eliminates justified envy but is less efficient than TTC. Atila Abdulkadiroglu, Nikhil Agarwal, and Parag A. Pathak, “The Welfare Effects of Coordinated Assignment: Evidence from the New York City High School Match,” American Economic Review 107 (12) (2017): 3635–3689, available at https://economics.mit.edu/files/14608. Description: The authors compare New York City’s uncoordinated assignment system with centralized assignment using a DA mechanism by examining both systems’ effects on families. Students across all demographic groups, boroughs, and baseline achievement levels receive, on average, a more preferred assignment from the coordinated mechanism. Students who were most likely to be left unassigned under the old system benefited the most. In addition, the geographical distance between a student’s school and home increased by 8 1/2 miles on average, suggesting that students choose to travel beyond their neighborhoods to access preferred schools. Students who were mostly likely to be administratively assigned in the uncoordinated system also saw increases in test scores and graduation rates in the centralized system. Christopher Avery and Parag A. Pathak, “Missing ‘One-Offs’ in High School Choice in New York City.” In Scott Duke Kominers and Alex Teytelboym, eds., More Equal by Design: Economic Design Responses to Inequality (Oxford, United Kingdom: Oxford University Press, forthcoming). Description: The authors find that high-achieving students from low-performing middle schools are less likely to apply and enroll in high-performing high schools in New York City. In addition, these students experience worse educational outcomes than similarly high-achieving students from high-performing middle schools.